The Christian's answer to that question must follow the example of Christ. Jesus himself settled the question when he responded to Jewish leaders who confronted him after he had said "I am the light of the world." When they denied him, Jesus said, "If you knew me, you would know my Father also" (John 8:19). Later in that same chapter, Jesus used some of the strongest language of his earthly ministry in stating clearly that to deny him is to deny the Father. Christians and Muslims do not worship the same God. Christians worship the triune God, Father, Son, and Holy Spirit, and no other god. We know the Father through the Son, and it is solely through Christ's atonement for sin that salvation has come. Salvation comes to those who confess with their lips that Jesus Christ is Lord and believe in their hearts that God has raised him from the dead (Romans 10:9). The New Testament leaves no margin for misunderstanding. To deny the Son is to deny the Father. To affirm this truth is not to argue that non-Christians, our Muslim neighbors included, know nothing true about God or to deny that the three major monotheistic religions -- Judaism, Christianity and Islam -- share some major theological beliefs. All three religions affirm that there is only one God and that he has spoken to us by divine revelation. All three religions point to what each claims to be revealed scriptures. Historically, Jews and Christians and Muslims have affirmed many points of agreement on moral teachings. All three theological worldviews hold to a linear view of history, unlike many Asian worldviews that believe in a circular view of history. And yet, when we look more closely, even these points of agreement begin to break down. Christian trinitarianism is rejected by both Judaism and Islam. Muslims deny that Jesus Christ is the incarnate and eternal Son of God and go further to deny that God has a son. Any reader of the New Testament knows that this was the major point of division between Christianity and Judaism. The central Christian claim that Jesus is Israel's promised Messiah and the divine Son become flesh led to the separation of the church and the synagogue as is revealed in the Book of Acts. There is historical truth in the claim of "three Abrahamic religions" because Judaism, Christianity, and Islam all look to Abraham as a principal figure and model of faith. But this historical truth is far surpassed in importance by the fact that Jesus explicitly denied that salvation comes merely by being merely one of "Abraham's children" (John 8:39-59). He told the Jewish leaders who rejected him that their rejection revealed that they were not Abraham's true sons and that they did not truly know God. Christians do not deny that Muslims know some true things about God. As a matter of fact, in Romans 1:19-20 Paul explains that all people have some real knowledge of God by general revelation, so that they are without excuse. Speaking at Mars Hill in Athens in Acts 17, Paul argued that even some of the Greeks' own philosophers and poets gave evidence of a rudimentary knowledge of God -- but this was not a saving knowledge, and the Apostle was brokenhearted when he saw the Athenians at worship. In making her claim that Christians and Muslims worship the same God, the professor claimed the authority of Pope Francis, and since Vatican II the Roman Catholic Church has become ever more explicit in its teaching that salvation can come without a conscious and explicit faith in Christ. This is simply not an option for evangelical Christians committed to the authority of Scripture alone and to the Gospel as defined in the New Testament. Francis J. Beckwith, a leading Catholic apologist and philosopher, defended the claim that Muslims and Christians worship the same God. At one point, Beckwith argued that two people could have differing knowledge of Thomas Jefferson while knowing the same Thomas Jefferson as the third President of the United States. He continued: "In the same way, Abraham and Moses did not believe that God is a Trinity, but St. Augustine, St. Thomas Aquinas, and Billy Graham do. Does that mean that Augustine, Aquinas, and Graham do not worship the same God as Abraham and Moses? Again, of course not." But this line of argument evades the entire structure of promise and fulfillment that links the Old Testament and the New Testament. Abraham and Moses could not have defined the doctrine of the Trinity while they were on earth, but they believed that God would be faithful to all of his promises, and those promises were fulfilled only and fulfilled perfectly in Christ. And, going back to John 8:56-58, Jesus said: "Your father Abraham rejoiced that he would see my day. He saw it and was glad ... Truly, truly, I say to you, before Abraham was, I am." Evangelical Christians understand that, theologically, there is a genetic link between Judaism and Christianity. That is why Christians must always be humbled by the fact that we have been grafted onto the promises first made to Israel. 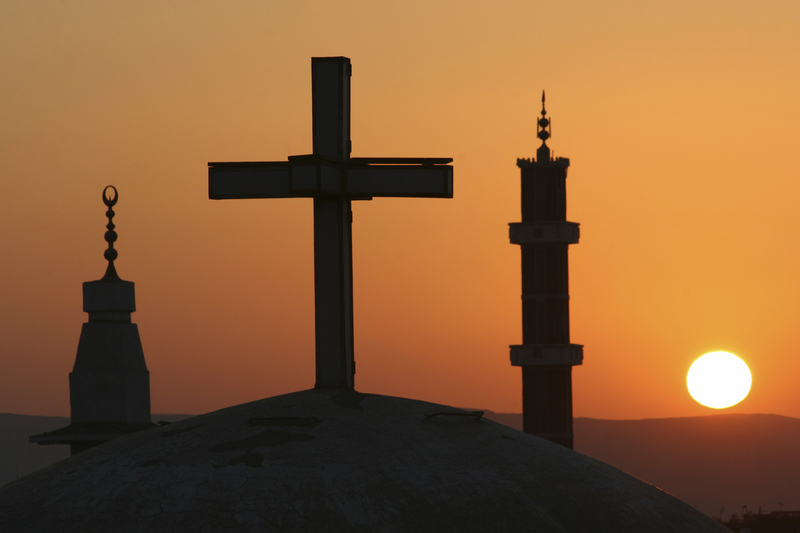 In terms of both history and theology, there is no genetic link between Christianity and Islam. The Qur'an claims that to confess Jesus Christ as the divine Son and the second person of the Trinity is to commit blasphemy against Allah. Hard times come with hard questions, and our cultural context exerts enormous pressure on Christians to affirm common ground at the expense of theological differences. But the cost of getting this question wrong is the loss of the Gospel. Christians affirm the image of God in every single human being and we must obey Christ as we love all people everywhere as our neighbor. Love of neighbor also demands that we tell our neighbor the truth concerning Christ as the only way to truly know the Father. We must also understand that the most basic issue is the one Jesus answered with absolute clarity. One cannot deny the Son and truly worship the Father. There is no question that the Muslim is our neighbor, but there is no way to remain faithful to Scripture and the gospel and then claim that Christians and Muslims worship the same God. Do Christians and Muslims Worship the Same God. What Does God Care What We Call Him.